Janet and Greg had the most elegant wedding day with the help of Magnolia Vine Events. Their September wedding was full of love, laughter and amazing views! The gorgeous views of Vulcan Park and Museum were expertly complimented by HotHouse Design Studio‘s floral arch and floral arrangements and On-Site Productions. As Janet walked down the aisle she looked absolutely stunning in her dress, and you could feel the joy radiating from her! After Greg and Janet shared a romantic first kiss with the best backdrop in the city, they headed to their reception where they danced the night away. J&G are the coolest couple. We love their easy going attitude and their sarcastic humor. Being around them is easy, and photographing them is easier. When we first met with them as they were searching for their wedding photographer, they warned us that they are a little awkward in front of the camera and that they may need some extra attention as far as photography goes. Looking through the images below, we just laugh at the thought of these two ever being awkward! 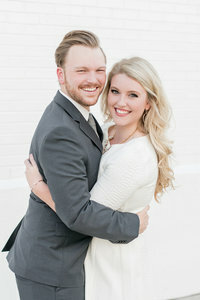 They are so natural together, and they are such a dream to photograph! Janet and Greg, we are so glad that we got to capture your perfect wedding day. Your day was filled with love and laughter and we know that you will continue to have that love in your everyday lives. Your laughs are infectious, and we know that you will have many more years of laughter together. Thank you guys for just being so cool, so easy going, and so easy to talk to. We are forever team Janet and Greg! !